I attended my nephew’s holiday potluck party last weekend: “bring whatever food you wish to eat and share…home cooked Singapore food encouraged.” I like so many dishes from Singapore, which one should I bring? 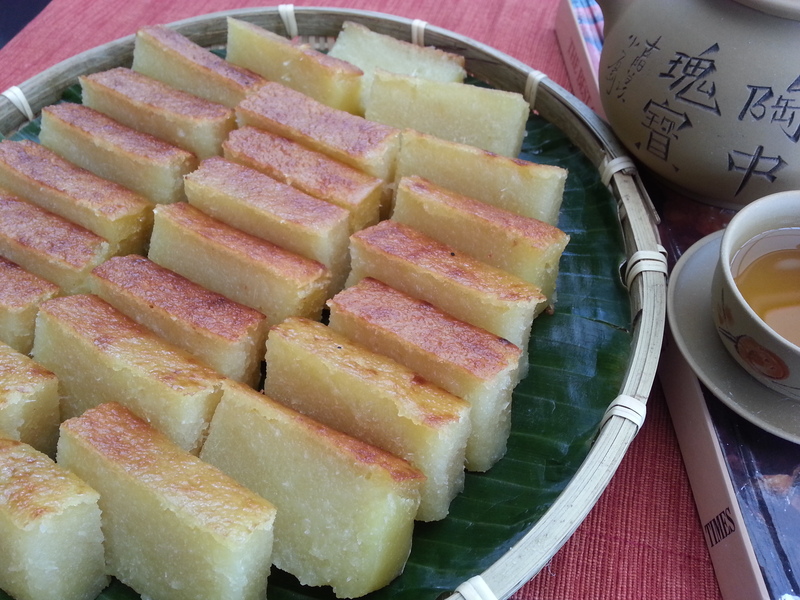 It has been a long time since I made Kueh Bengka Ubi, and it is so easy to make and so tasty, you can’t eat just one. Promise. Grease a 8″ x 8″ square baking pan with butter. Line the pan with parchment paper, leaving 1/2 ” flaps over the edges to lift the cake from the pan later. Whisk sugar, cornflour, eggs, melted butter, vanilla essence, and salt in a heavy sauce pan until blended. Cook over medium heat until heated through and sugar dissolves. Add coconut milk and stir well. Cook for another minute. Pour coconut and egg mixture over grated cassava in a large mixing bowl and stir until blended. Add the pandan leave pieces and knead with your hand to give the mixture the pandan flavor. Remove the pandan leaves. Pour the cassava mixture into the lined square pan. Bake at 350 degree F for 15 minutes till cake turns light brown. Reduce the oven temperature to 275 degree F and bake for another 1 – 1 1/4 hour until the top of the cake is golden brown. Remove from the oven and allow to cool for 10 minutes. Lift the cake from the baking pan using the flaps of the parchment paper and allow to cool completely before cutting. Arrange the pieces nicely on banana leaves and serve with Chinese tea. Delicious! 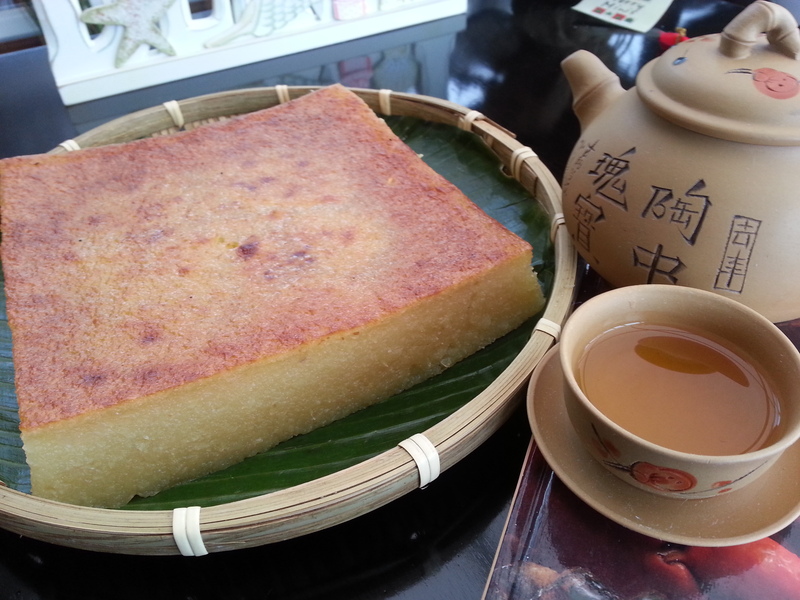 Do you have a recipe for the Vietnamese version? I would love to try it. What is it called in Vietnam? Thanks!